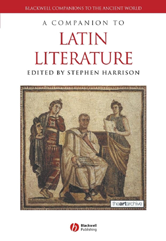 A Companion to Latin Literature gives an authoritative account of Latin literature from its beginnings in the third century BC through to the end of the second century AD. Provides expert overview of the main periods of Latin literary history, major genres, and key themes. Covers all the major Latin works of prose and poetry, from Ennius to Augustine, including Lucretius, Cicero, Catullus, Livy, Vergil, Seneca, and Apuleius. Serves as both a discursive literary history and a general reference book.